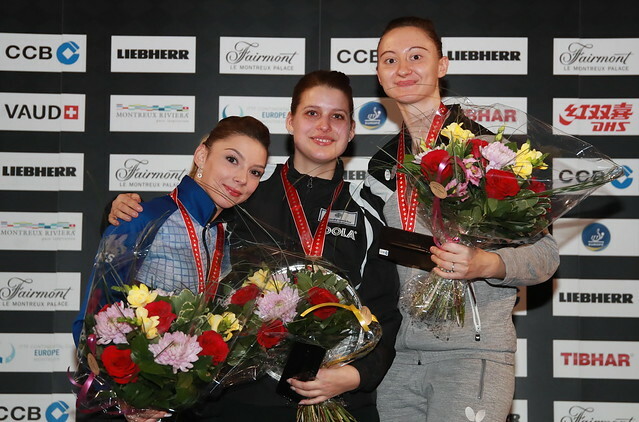 Winners earlier this year in February in Montreux, Germany’s Timo Boll and Romania’s Bernadette Szocs are set to defend their respective Men’s and Women’s titles at the forthcoming CCB 2019 Europe Top 12 Cup to be staged on Saturday 2nd and Sunday 3rd February. It is the second consecutive year that Montreux has been the host and also the second year when supported by the China Construction Bank (CCB). One of the most well established tournaments on the international calendar, the event known as the Europe 12 was first staged in Zadar in 1971; the title remained the same until 2015 in Baku when becoming the Europe Top 16. Furthermore, not only is Timo Boll, the defending champion, also he is one of the most successful players in the history of the tournament; overall he has won on six occasions. If he can win this year he will match the most successful of all, Sweden’s Jan-Ove Waldner. He won seven times between 1984 in Bratislava and 1996 in Charleroi. Notably, in addition to last year, Timo Boll succeeded in 2002 in Rotterdam, the following year in Saarbrücken, before in 2006 winning in Copenhagen; later in 2009 and 2010, he prevailed in Düsseldorf. Two steps below, Dimitrij Ovtcharov and Vladimir Samsonov of Belarus, both have won four times, both will be on duty this year in Montreux. Moreover, the wins recorded by Dimitrij Ovtcharov were all in consecutive years; in 2014 he won in Baku and then followed with success in Gondomar, Antibes and Lyon/Villeurbanne. An impressive record, it is the same for Vladimir Samsonov, but from a different generation; he succeeded in 1998 in Halmstad, the following year in Split before again winning in 2001 in Wels and in 2007 in Arezzo. Past winners on duty and there is one more; Portugal’s Marcos Freitas won in 2014 in Lausanne. Meanwhile, in the Women’s event, in addition to Bernadette Szocs, former winners competing in Montreux are Li Jie of the Netherlands, Poland’s Li Qian and Luxembourg’s Ni Xia Lian. Li Jie won in 2017 in Antibes, Li Qian in 2009 in Düsseldorf; Ni Xia Lian in 1997 in Eindhoven and one year later in Halmstad. However, the player at the head of the Women’s invitation list has yet to secure the title; Austria’s Sofia Polcanova is the top name.